July 29, 2018 at 12:10a.m. Down to the last out and trailing by four runs, Boardman cleanup hitter Gavin Hyde clobbered Aidan Booth’s 1-2 pitch into the left-field corner to score Caleb Satterfield, Cal Huston and Jack Ericson. When the ball connected off his bat, Hyde was confident that he would running for extra bases. After trailing by six, momentum was on Boardman’s side. But with first base open, New Albany manager Greg Ecleberry intentionally walked Dylan Barrett, who represented the winning run. One pitch later, a groundout clinched New Albany’s 9-8 victory on Saturday at the Hoover Community Recreation Complex. Boardman trailed 9-4 going into the final at-bat. With one out, Anthony Triveri singled. A walk and an error then put Satterfield and Huston on to load the bases. Ericson walked to bring home Triveri and set up Hyde. “I was just trying to hit it somewhere in the outfield in a gap,” Hyde said. “It was exciting but I still knew that we had work to do. The past three summers, these Boardman and New Albany players have played seven times in state tournaments. 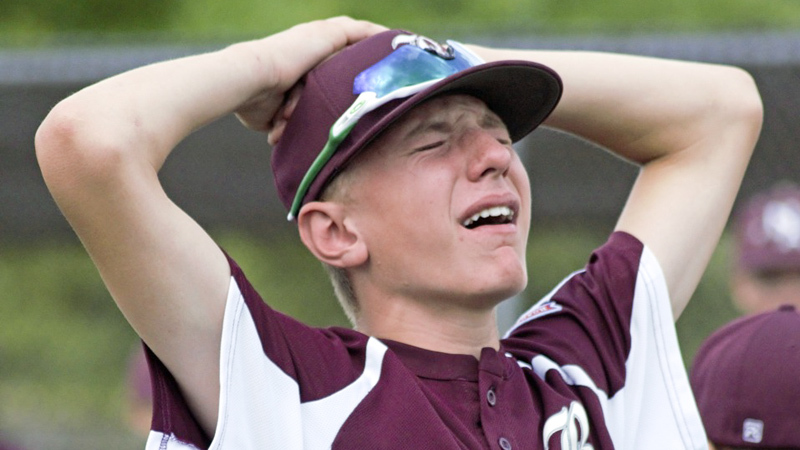 Boardman won state titles as 10- and 11-year-olds and New Albany has a 4-3 series lead to go with one crown. Ericson, who tripled twice and walked twice, pointed to his team’s pride in threatening late. “Never quit and always try to keep our heads high until it’s over,” Ericson said, calling New Albany “a great team. We’ve had some great battles with them. A very unusual play kept the state championship game close. In the third inning, New Albany’s Charlie Oakleaf homered for a 10-2 lead. Before the next pitch, Boardman appealed that baserunner Ben Liebel missed home plate. The appeal worked, wiping out the two-run homer to keep the score 8-2. Hyde isn’t sure who on his team, first noticed the baserunner missing the plate, but he credited Coach Dom Conti for bringing it to his attention. New Albany scored three runs in each of the first and second innings. Zach Casey hit a two-out, two-run double in the first inning. Garrett Given and Liebold each scored twice, and Oakleaf drove in two runs. Boardman almost escaped the first inning allowing no runs. With two outs, Casey hit a line drive at Ericson. The 5-foot-9 third baseman stretched and the glove deflected off the tip of his glove down the left-field line. “It was right off the end of the glove, Ericson said. Down 3-0, Satterfield, Huston and Ericson drew walks off New Albany starter Ben Clark. A wild throw to third base allowed Satterfield to score. Huston came home on Barrett’s sacrifice fly. Ericson tripled and scored on Hyde’s hit in the third inning. Ericson’s other RBI triple came in the fifth inning when Boardman stranded three baserunners. In that frame, Satterfield came very close to avoiding Clark’s tag at the plate. New Albany second baseman Brandon Ecleberry ended the threat with a diving catch to retire Marty Stanchowicz. July 26, 2017 12:05 a.m.
July 25, 2018 12:10 a.m.
July 28, 2018 12:10 a.m.
July 27, 2018 12:10 a.m.